In Programme coverage are incorporated 10 countries from the Black Sea basin, Azerbaijan, Armenia, Bulgaria, Georgia, Greece, Moldova, Romania, Russia, Turkey and Ukraine. The overall objective of the Programme is to improve the welfare of the people in the regions of the Black Sea basin through sustainable growth and joint protection of the environment. 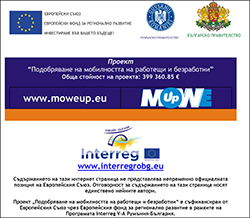 Four information sessions on the second call for proposals under the Interreg V-A Romania-Bulgaria Programme will take place within the eligible area of the Programme. The first one took place today, 05th of February 2016, in Dobrich, which was attended by the team of the Association "EUREKA" and another 65 potential beneficiaries from Dobrich, Silistra and Ruse districts. On 02.06.2015 in village Kaynardzha participants in the ninth international conference of the European Network "Places of Peace" were welcomed by the Mayor of Kaynardzha - Mr. Lyuben Sivev, Chairman of the mMunicipal Council - Mr. Ivaylo Petkov and District Governor of Silistgra - Mr. Stoyan Bonev with traditional Bulgarian round loaf, on which was written "PEACE." On 23 October 2014 in the municipality of Navodari, Romania, was held working meeting between representatives of the Joint Technical Secretariat Calarasi Mr. Alexandru Kirya and Mr. Christian Rado and the partners in the project "Cross-border business center for tourism development and construction of Agro and Fish Market", MIS-ETC 599 CBC program" Romania-Bulgaria 2007-2013 "- municipality of Navodari and association European Institute of cultural Tourism EUREKA.